Jacky Durand (born February 10, 1967 in Laval, Mayenne) is a retired French professional road bicycle racer. Durand had an attacking style, winning the Tour of Flanders in 1992 after a 217 kilometres (135 mi) breakaway, and three stages in the Tour de France. Durand turned professional in 1990. He was national road champion in 1993 and 1994 and won Paris–Tours in 1998, the first French winner in 42 years. 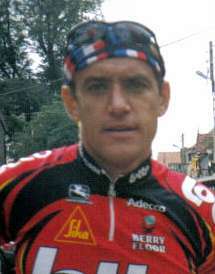 Durand rode seven Tours de France, finishing last in the 1999 race. In 1995 he was the surprise winner of the prologue, starting before it began raining. He wore the yellow jersey for two days. Durand won the combativity award in the 1998 and 1999 Tour de France; the latter year he also took the Lanterne Rouge. He retired at the end of 2004. He has since worked for Eurosport as a commentator. Durand was born to a poor farming family in the Mayenne region of northern France. He started racing in the minime class, the very youngest, but never won a race there or in the older cadet category. "It's difficult to win as a kid when you're neither a climber nor a sprinter," he said. "For me, the most beautiful jersey in the world is the French champion's. Yes, when they play the Marseillaise for you after a championship and then you go and show it off for three weeks in the Tour de France, the national flag on your shoulders, it's emotion and pleasure every day." As a senior, however, he won the national amateur team time-trial championship in 1988 with Laurent Bezault, Pascal Lino and Thierry Laurent. He turned professional in 1991. Jacky Durand became celebrated for long, lone attacks which sometimes succeeded but usually didn't. The French magazine, Vélo, printed a monthly Jackymètre to log the kilometres ridden at the head of races during the course of the season. Durand said: "Fortunately, in cycling, it's not always the best who wins, otherwise we wouldn't win so often." His riding style was encouraged by his first directeur sportif, Cyrille Guimard. It brought him a seemingly suicidal win in the Tour of Flanders (see below). Guimard told him to attack early in the national championship at Châtellerault in 1993, to try his chance and to spoil those of Laurent Brochard and Luc Leblanc. The writer, Jean-François Quénet, said Guimard told Durand to attack far from the finish "because he didn't want to see Laurent Brochard in blue, white and red and even less did he want a second consecutive title for Luc Leblanc, who was in disgrace in the Castorama team.". I'm not a revolutionary of any sort, but on the bike, I've always refused to come out of a mould. It astonishes me that most riders are followers, even sheep. A lot of them, the only people who know they're in the Tour are their directeurs sportifs. I couldn't do the job like that. They finish the Tour without having attacked once, maybe the whole of the season, even the whole of their career. I'd rather finish shattered and last having attacked a hundred times than finish 25th without having tried. Yes, I get ragged about it, but it's always in a friendly way. In the bunch, the guys know that Dudu is as likely to finish a long way behind them as first. Jacky Durand won the Ronde van Vlaanderen, or Tour of Flanders, in 1992, 36 years after the last French winner, Jean Forestier, in 1956. He broke away from the field with Thomas Wegmüller after a third of the race, with 217 km still to ride. His success as an outsider, and after such a long lone ride, stayed in the memory of Belgian fans. Years later Durand was stopped for speeding. The Belgian policeman who came to his car said,"Vous avez gagné le Tour des Flandres en nonante-deux" - You won the Tour of Flanders in '92 - and let him drive on. Durand finished his career with Belgian teams. "Winning the Ronde made me a bit of a naturalised Belgian," he said. Durand took drugs during the Tour de la Côte Picarde in 1996 and was given a one-month probationary suspension. He was disqualified during the Tour de France in 2002 for holding on to a car during the mountainous stage to the Plateau de Beille in the Pyrenees. There had been complaints from riders, including the Czech, Jan Svorada, that he had done the same the previous year. Durand retired from racing in 2005 after receiving no team offers. He followed that year's Tour de France as representative of the supermarket chain, Champion. He is now a television commentator for Eurosport. Durand stayed loyal to his first club, CC Renzé, throughout his career. He lives in Grenoble. ↑ "Durand calls it a day". cyclingnews.com. 16 December 2004. Archived from the original on 9 June 2010. Retrieved 9 June 2010.